Cape Town - Cricket South Africa on Sunday named four new caps in the Proteas' squad for the three-match one-day international (ODI) series against the New Zealand Black Caps. 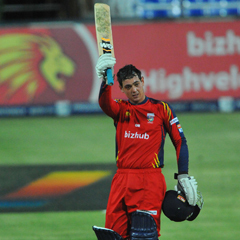 They are the Highveld Lions duo of Quinton de Kock and Aaron Phangiso, Farhaan Behardien of the Titans and Rory Kleinveldt of the Cobras. All four have represented the Proteas in T20 cricket while Kleinveldt has also been part of the Castle Lager Test squad. The selectors have decided to rest Jacques Kallis as part of the process of managing his workload, while JP Duminy remains on the long-term injury list. “We only have the three ODI matches against New Zealand plus another five against Pakistan to prepare our squad for the ICC Champions Trophy Tournament in England in the middle of the year,” commented CSA Selection Convener Andrew Hudson. “The Champions Trophy also marks the halfway point to the next ICC World Cup so this is a critical part of our preparation to win these two major ICC events. “We have done well in our ODI series over the past year with victories over Sri Lanka and New Zealand and a drawn series in England, so we have every confidence that this squad is on the right track. “JP Duminy should also be fit by the time of the Champions Trophy to give us another selection option. Proteas' ODI squad: AB de Villiers (Titans, captain), Hashim Amla (Dolphins), Farhaan Behardien (Titans), Quinton de Kock (Highveld Lions), Faf du Plessis (Titans), Colin Ingram (Warriors), Rory Kleinveldt (Cape Cobras), Ryan McLaren (Knights), Morne Morkel (Titans), Robin Peterson (Cape Cobras), Aaron Phangiso (Highveld Lions), Graeme Smith (Cape Cobras), Dale Steyn (Cape Cobras), Lonwabo Tsotsobe (Dolphins).